The game contained a fully voiced cast of over 60 characters, multiple endings and an argument based combat system. The game has a rating of 66% positive reviews (Mixed) on Steam from a total of 15 reviews. This year, Stegalosaurus Game Development released two more of their games on Steam: Super Army of Tentacles 3 (which I reviewed recently) and The Ghost of Joe Papp, the game I'm reviewing today. 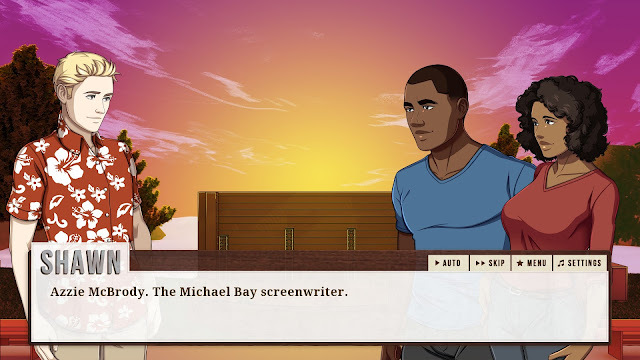 The Ghost of Joe Papp works like many traditional visual novels: you read lots of dialogue and exposition, and every so often you get to make a conversation choice which alters how characters react to you (and ultimately the story itself). What makes it slightly different to the ones I've experienced before is that you're able to play from two perspectives: that of actors Scott and Molly. 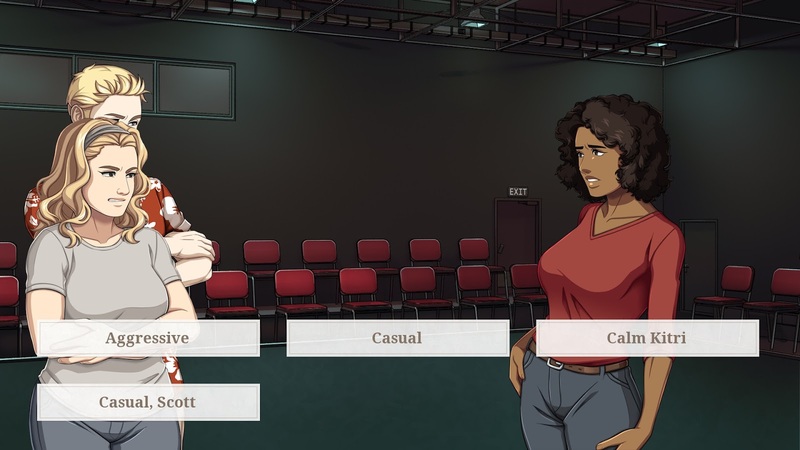 There's also a third option where you're not given the opportunity to pick a conversation choice and this is more like a "kinetic novel": a type of visual novel that is non-interactive. In this game you experience the drama as the cast working on productions of "The Merchant of Venice" and "Hamlet" take potshots at each other for just about everything, from drug use, to ambition, to nepotism, to even taking advice from ghosts. Your conversation choices affect the relationships between the actors and ultimately the success (or failure) of the productions. I actually received the game as a free review key thanks to some new functionality that was introduced to Steam Curators earlier this month called "Curator Connect". So, just as it was with Super Army of Tentacles 3, I just wanted to thank Stegalosaurus Game Development for providing me a review copy since I do love narrative rich games and visual novels definitely fit the bill. The game is by no means as surreal as a visual novel/RPG hybrid based on the Cthulu mythos but it's still not your average visual novel, especially when the characters come from a town named after an American theatrical producer or the fact they are quite comfortable talking to a ghost (well, all except one of the characters in the game). Speaking of ghosts (this isn't really a spoiler since you encounter her at the beginning of the game), Shakespeare is actually one of the characters… in the form of a female ghost – a nod to all the theories circulating out there that Shakespeare was in fact a woman. I really love the character artwork in this game by Adyrn and background art by Alexander Vetrov (aka Fuyunokawa). You don't only get the chance to play as one character, but two: Scott and Molly. You only get the full picture after playing as both characters too so it's worth replaying as the other character. The conversation choices you make will have an impact on the relationships between the actors; this in turn has an impact on how the productions of "The Merchant of Venice" and "Hamlet" are ultimately performed which means you can tailor the epilogue depending on how nice (or snarky) you are - neat! It wouldn't be a Stegalosaurus Game Development game without random dinosaur trivia (just as it was with Super Army of Tentacles 3) and The Ghost of Joe Papp, delivers. There are 4 achievements to earn and they should be pretty easy to acquire. There are tons of references to the works of Shakespeare and even the man himself (or should that be: "woman herself?"). Shakespeare buffs should have a field day with this game. So wait... am I going to talk casually to Scott or Scott is going to talk casually? Unfortunately, just as it was with Super Army of Tentacles 3 and the Cthulu mythos, I'm really not well versed with Shakespeare or his works. So, if anyone is uncultured like myself, you'll just feel stupid playing this game or you'll be alt+tabbing to check out on Google or Wikipedia what the joke is. I occasionally found it hard to follow who was actually talking, especially when there was a group of actors on one side of the screen. Visual novels usually only have a couple of characters on a screen at a time; this is to eliminate any confusion of who is involved in the conversation (even if there are a group of people nearby at the time). Instead of choosing from multiple lines of dialogue, in The Ghost of Joe Papp you choose from multiple icons with descriptions like "Aggressive", "Casual", "Calm So-and-So" and "Casual, What's-his-face". It'll probably become clearer after going through the game once but on your first playthrough, sometimes it's not clear what the options actually mean; for example, does "Casual, What's-his-face" mean "What's-his-face" will speak instead (and in a casual manner) or does it mean you will speak casually with "What's-his-face"? Stegalosaurus Game Development makes it no secret that the game is short, advertising on the Steam store page that a typical gameplay session takes 30+ minutes. I found it took me about 45 minutes on my first playthrough and then it was a bit shorter for my next two; after three playthroughs, I've spent just under two hours with the game. 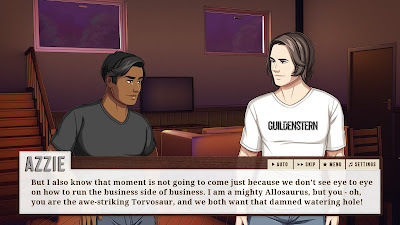 Stegalosaurus Game Development tries their hand at a more traditional visual novel but without the usual setting or characters. The game is a bit rough around the edges and short but it has appealing artwork, differing epilogues, the ability to play as two characters and personalities that aren't two-dimensional. Also recommended for Shakespeare buffs. Is the game worth $5.99 USD? : No, I think $5 USD is a fairer price for a short but quality visual novel. Nowadays, visual novels are a dime a dozen on Steam and I'm always seeing them come up in my Discovery Queue; in fact, by one measure, checking everything that's tagged with "Visual Novel" on Steam and browsing "all popular releases" you'll find over 900 games tagged as a "visual novel" (although I admit, the term is used very loosely by Steam users, so the figure is probably not that high, but high enough for competition to be fierce). A lot of visual novels on Steam are often only a couple of bucks or even free to play, but mileage (obviously) varies.